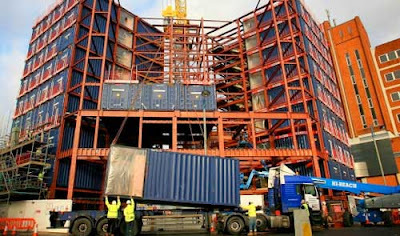 The world's first hotel built from recycled shipping containers has popped-up in Uxbridge, West London. Each prefabricated container comes fully-equipped with fixtures, furniture, and windows from a factory in China. The company, called Travelodge, says that constructing a hotel this way is 25% faster and 10% cheaper than the more traditional construction methods. Also, construction is much quicker, because all that has to be done is to fit each container together like it was a giant Lego set. Travelodge plans to follow up with a 307-room version at Heathrow. They expect to save up to 10 million pounds (18.6 million dollars) a year on hotel development by using this new method. Perhaps the smartest and most practical of all designs, shipping containers make perfect stackable office space for this warehouse in a design by Clive Wilkinson for a U.S.charity event company.The 47,000 square foot warehouse is filled with shipping containers that have been transformed into modern office spaces. The idea is cheap, simple, maneuverable and saved the company a ton of money on construction costs, and it allowed the entire space to be more open and airy. , construction costs were relatively inexpensive when compared to traditional construction. 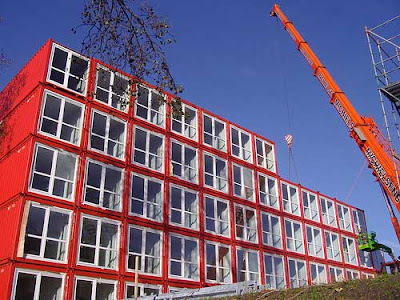 These boxes were intended to only be a temporary solution to a student accommodation problem in Holland, but shipping containers provide an effective solution to low-cost student housing. 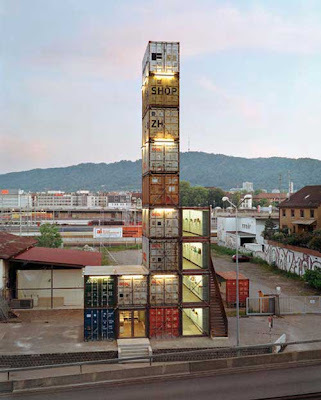 Containers are home to not only the 1000 units that each have a private balcony, but a cafe, supermarket, office space, and even a sports area. Units are arranged in "blocks," each block containing a service unit with centralized electricity, internet, and networking systems. This shipping container shop is another project situated in Europe. The messenger bag shop can be found in Zurich's industrial quarter, rather appropriately. And this isn't just a market stall hidden inside a metal box, as you can see these containers are stacked up, hitting 85 feet high. The company continue the ethos of the goods they are selling, using recyclable material to create a retail space that you'd have to have a look around in. In other parts of the world, places like Odessa, Ukraine already have the the biggest shopping mall in all of Europe which uses stacked shipping containers to form alleys throughout the 170 acre site. 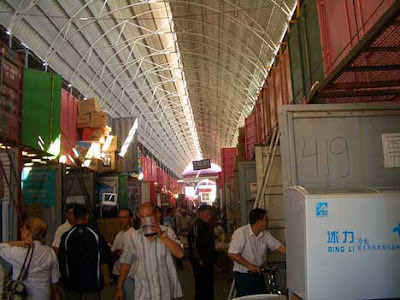 In Asia, the Dordoy Bazaar in Bishkek, Kyrgyzstan is almost entirely composed of empty shipping containers stacked two high and chock-full of inexpensive trinkets and toys. 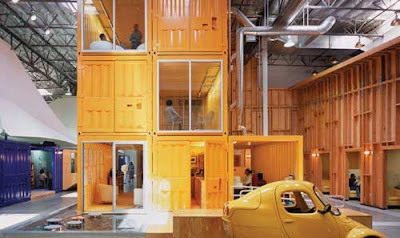 So, in other words, shipping container architecture is nothing new, but it is new when it comes to residential and office applications.